Armchair blogger Matt Savage was able to rely on both audio AND video for his latest report - it's our visit to Elland Road to take on Leeds. An ideal 57th birthday for Wednesday manager Dave Jones would be for his team to pick up their first point/s of the season. That would be easier said than done however as rivals Leeds United, unbeaten so far this season, stand in their way. A fiery atmosphere would no doubt ensue as this Yorkshire derby has bad blood between the fans but a minutes applause was well observed for the deceased Leeds fans over the past 12 months before kick-off. 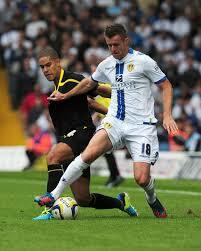 LUFC's Michael Tonge hold off SWFC's Giles Coke. As expected it wasn't long after kick off that the first talking point materialised - a 2nd minute Stephen Warnock foul on Chris Maguire would have seen the Leeds United defender booked at any other time in the game but the former Aston Villa man walks away with a word in his ear by the referee. When Giles Coke fouls Rodolph Austin a couple of minutes later, Tom Lees sees his free-kick cleared by the towering Anthony Gardner. Wednesday have started brightly and a cross by the returning Lewis Buxton is cleared by United captain Austin before David Prutton flashes a shot at goal that doesn't test Paddy Kenny. 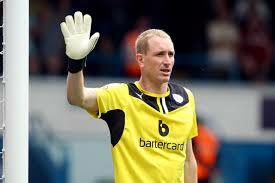 At the other end, Chris Kirkland punches clear a dangerous looking Luke Murphy cross on the 9th minute. A Maguire corner from the left by-line a minute later is dealt with by Ross McCormack and the quietness of the home crowd is noticeable. As the Owls look to press home their early advantage, a fantastic leap by Kenny sees the former Sheffield United favourite punch a brilliant Michail Antonio dinked cross clear just inches away from Atdhe Nuhiu's head. The Republic of Ireland goalkeeper is making his 600th senior appearance today in a career that has seen him become one of the best keepers at Championship level. In a burst of pace by Dominic Poleon, the academy product bursts past Buxton with ease and advances at the Wednesday goal only for Coke to position himself between the player and the ball and earn the Owls a free-kick. The youngster has pace to burn and looks a real asset for the Whites. In the 18th minute the talented youngster again gets the better of Buxton, only for the right-back to get back at him and usher away the danger well, with Leeds fans unsuccessfully claiming for a penalty. Replays show Buxton with a fistful of Poleons shirt on his shoulder whilst poking the ball away but nothing to put the player off or break his stride. A 20th minute by Liam Palmer is scrambled away before Maguire's return ball earns the visitors a corner. Maguire himself takes the set-piece that Nuhiu heads at goal only for Kenny to stop the ball just in front of the line amidst Gardner being manhandled by Jason Pearce, levelling out the unsuccessful penalty claims. The first yellow card of the day is shown to Maguire of Wednesday when he races back to defend a Leeds counter and swipes Paul Green's legs, not a nasty challenge but a clumsy one from the forward. When a 23rd minute United attack breaks down due to a deflected catch by Kirkland, the visitors break and catch Leeds out - leaving 7 players in the Owls box, the pacey break by Wednesday is halted by the referee though who stops play due to Warnock feigning injury just outside the opposing box. The dangerous Poleon looks to leave Buxton in his wake again in the 25th minute but the former Stoke defender again tackles the youngster in what is becoming a tantalising battle between the two. A shot wide by Palmer was the best the academy product could do after chasing a no-hoper of a ball and lashing across the goal before Luke Varney fouls Antonio. The resulting free-kick by Jeremy Helan comes to nothing but moments later Leeds are indebted to Pearce for clearing David Prutton's dangerous ball into the box. With 30 minutes on the clock is surprising to hear the only noise in the stadium is coming from the away end as Leeds' usually vocal support is left dwindling. That almost gets turned on its head a minute later though, McCormack does brilliantly to evade a challenge and get central, he then fires a delightful chip to attempt to catch out the Wednesday keeper only for Kirkland to back track quickly and produce a quality save - tipping the ball over the crossbar and waking up the home fans. The corner breaks down however and on the 33rd minute Varneys whipped cross is into an empty box and the former Wednesday loanee shakes his head in frustration at the lack of support he has. When Buxton again thwarts Poleon moments later, the camera inadvertently pans around the stadium, highlighting the amount of empty seats at Elland Road. A United attack is ended when Varney fouls Helan and Wednesday build an attack themselves - earning a corner when Coke squares a ball that Lees cuts out. The 35th minute Helan delivery reaches the back post where Antonio heads back across goal and Kamil Zayatte attacks it well, guiding the ball with his head past 6 Leeds defenders including a keeper grasping at thin air. As the away following celebrate Kenny and Warnock berate Green for allowing the header at the back post. As the home side looks to get back into the game immediately, Nuhiu tracks back deep into his own half when Helan is caught out up field and the attack dwindles to nothing. The visiting fans are in full voice as renditions of 'Barmy Army' and 'Ole Ole We're All Wednesday Aren't We' are followed by the famous 'Hark now hear'. Leeds earn a 43rd minute corner that Warnock delivers well and the powerful Austin heads wide of the Kirklands goal. Moments later and Zayatte concedes a free-kick for a foul on McCormack - only for the set-piece to come to nothing again. As the half comes to a close, Antonio does fantastically well to beat 2 men, earning a corner in the process. The same routine of the goal is followed but Leeds concede another corner rather than another goal. The second corner lands at the back post again where Antonio rises above his 2 markers this time but heads narrowly wide. HT REVIEW: A well deserved half-time lead for Wednesday, playing the better football and creating the better opportunities. Poleon and McCormack will always be a threat though and the Owls backline are doing well to keep them shackled, Buxton especially as his battle with the lively Poleon has been a highlight of the first half. The home fans are surprisingly quiet so far but I'm sure they'll wake up sooner rather than later as their team aren't being totally outplayed and it has been a good half. As much as it goes against my instincts as an Owl, I can't help but like Leeds defender and captain Rodolph Austin - his full blooded approach is similar to Kamil Zayatte's - I like that in a defender! I'm glad to see that only a small section of Leeds fans had a little Dave Jones chant that wasn't picked up by their fellow supporters. A Lilt and bag of mini Cheddars keeps me occupied at half-time and the second half is moments away. 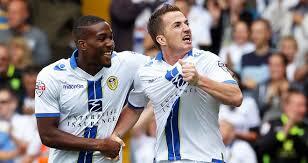 Leeds United goalscorer Ross McCormack. The games first substitution takes place before the second half commences, former Sheffield United midfielder Michael Tonge replaces Paul Green in a bid to add some more creativity to the midfield. The first foul of the half comes barely 2 minutes in when Lees fouls Maguire with no real danger in the offing. Good defending by Wednesday captain Gardner sees the former Tottenham Hotspur man marshal out a ball with Poleon snapping at his heels to no avail just moments after being on the receiving end of a high challenge. As the Whites grow into the game quickly, Poleon pointlessly pushes Palmer with the midfielder having nowhere to go and facing his own corner flag - relieving the pressure in the 51st minute. The litter strewn pitch almost graces a second goal but £1million signing Luke Murphy can only lash over the crossbar - frustrating the home crowd. After good work out wide Lee Peltier takes a dive in the box that is waved away by the referee before the very next attack sees Poleon fall to the deck in comedy style trying to con a penalty but to no avail. Credit to Helan and Buxton for the defending in both instances. Another yellow card is flashed in the 55th minute, this time to Buxton for stalling his throw-in much to the annoyance of the Wednesday bench but 2 minutes later, they have more cause for concern. The Leeds fans are mid-chant ('Marching on Together') when McCormack picks the ball up just inside the Wednesday half, bears down on goal, knocks the ball past an advancing Zayatte, connects with his own through ball before calmly slotting underneath Kirkland and scoring a fine solo equalising goal. The 'Marching on Together' chant now bellows from the home stands much louder - followed by the usual disgusting, Dave Jones chant - this time with added vocal support. The Whites are also getting the referees decisions as the momentum is firmly with the home team. A Warnock free-kick, Peltier cross and Warnock corner are all dealt with by the towering Wednesday back-line before a 63rd minute McCormack corner is met by Austin who tamely heads wide. That break in play allows the returning Reda Johnson to enter the action, replacing Maguire and the Benin international almost makes an immediate impression - floating a cross into the box that Lees just manages to get a head onto before Nuhiu can head at goal. Wednesday look to up the momentum and crosses are peppered into the Leeds box, cleared well by Austin, Tonge and Lees before Jacques Maghoma replaces Nuhiu in the 69th minute. When Coke defends well again, breaking up yet another Leeds move - he is upended by Varney and the forward is lucky to escape the book before Matt Smith replaces him on the 72nd minute. Shortly after and a tangle ensues between Peltier and Antonio when the Leeds man climbs on the wingers shoulders to clear a ball, after a quick wrestle on the floor the referee diffuses the situation and play can continue. The home side sees their momentum quashed when McCormack fouls Gardner when the Owls captain defends well against the influential midfield/striker. In the last 10 minutes Antonio has lost his way but he almost puts it all behind him when he beats his man, skips inside and drives a low shot at goal only for Kenny to be behind it to make a good solid save. A 77th minute effort at goal by McCormack is blocked by Gardner before Tonge sees his effort similarly dealt with by Zayatte. A wasted Leeds corner leads to a Wednesday attack which ends when R.Johnsons cross is cleared by Tonge. On the 81st minute Maghoma drives into the box and his swivel-shot is almost caught by Pearce in the 6-yard box with Kenny diving and out of the picture. This blatant handball is deemed accidental by the referee and play continues with Leeds breaking out towards the Wednesday half, rather than stand and feel hard done by though, the Owls get men back in numbers and defend well. A Zayatte header from a Helan corner flies inches wide before a well deserved standing ovation for Poleon is upheld when he is replaced by El Hadji Diouf in the 85th minute. A tame shot by Murphy follows which Kirkland collects with ease before Kenny raises highest to clear an Antonio cross. On the 88th minute Pearce fouls Antonio but Helans set-piece is cleared by Warnock as Wednesday press to take the lead. Determined work by Palmer ends with Coke driving a shot at goal that Pearce does well to block with Kenny sprawling. A 91st minute header by R.Johnson misses to the right of goal before a body check foul on Coke in the Leeds box is waved away ending a Wednesday counter-attack. With the away team looking the likeliest to score again, a clumsy foul by R.Johnson at the edge of his own box allows the home team to have a shot at goal. The resulting free-kick, deep into added on time is fired at goal by McCormack but it fails to beat the wall. The game ends shortly after and the teams deservedly share the spoils. FT REVIEW: The match evened itself out in the end and a deserved point for both teams come the full-time whistle. I can see Leeds struggling in their attack play if they lose Ross McCormack (Middlesborough have bid higher this week according to some reports) as any good play was constructed mainly by him. This was a much improved performance by the Owls and feel somewhat unlucky to come away with just a point taking all into account. We still need that midfielder and striker in my opinion but in Dave Jones I trust! 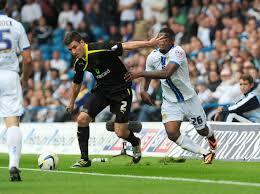 SWFC's Lewis Buxton wins his battle with LUFC's Dominic Poleon. Dave Jones: "We played well and I think most managers would've taken a point from Elland Road before the game but I felt we should've taken all 3 points. We had the chances, we might've had a penalty and in the end we were unlucky. We should have done better for their goal and we will continue to work on those situations. Overall we have done ok, we are off the mark and we move on to the next game. Lewis Buxton was absolutely magnificent - he came into the team today on the back of three days training and you wouldn't have thought he'd been away." DJ talks to BBC Sheffield here. Brian McDermott: "I said to the lads at half time - 'lets not wait for anything, lets grab it, somebody grab it' and McCormack certainly did that - it was a fabulous goal. We've turned down two or three bids for him and you know my view, that's not changed. I've spoken to Ross and you've seen the quality he brings. You saw his celebration too -he loves this club and I like working with him. As far as I'm concerned Ross wants to be here, I want him to be here - that's their prerogative to do what they like."